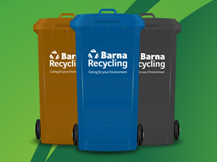 Top Tips for Keeping Your Wheelie Bin Clean! As the summer kicks in, it’s not uncommon for wheelie bins to become smelly. Here are some of our top tips by bin type to keep your bin clean and odours at bay! • Close your bin lid after use to stop flies and vermin from entering the bin. This also prevents cats, dogs, birds and foxes from slitting bags open and causing a mess. • Place five or six sheets of newspaper in the bottom of the bin to catch any moisture and prevent waste sticking to the bottom of the bin. • If possible, store your bins in the shade, out of direct sunlight to slow decomposition of waste. • Wash your bin using an anti-bacterial disinfectant every two months to get rid of any residues and to kill off any germs and reduce any smells. • Empty the contents of dirty nappies into the toilet before placing in the general waste bin. • Only place permissible items into your general waste bin e.g. nappies, tin foil, aero-board. Check out what goes in my black bin page for further advice. • Wash and dry bottles and cans to before putting them into your recycling bin. To reduce the water used, wash items for recycling at the end of the washing up or by using any spare space in the dishwasher. • Place five or six sheets of newspaper in the bottom of the bin to catch any moisture and keep your bin clean. • As per the general waste bin close your bin lid after use and wash every two months with an ant-bacterial disinfectant. • Place fish and meat for disposal in a plastic bag in the freezer until the compost bin collection day. This avoids them decomposing and releasing nasty odours in between collections. • Dispose of vegetable peelings or tea bags etc. in a compostable bag or wrap in old newspaper to help absorb some of the moisture. • Place moth balls or strong solid air freshener in a small net bag or old tights and attach to the inside of the bin lid with adhesive to help keep flies away. • As per the general and recycling bins, always close the bin lid after use and wash every two months. If you have any further questions on how to keep your wheelie bins as good as new, please contact our customer service team on 091 771619.